Welcome back. Jogging a few months ago, I had another oh my gosh! moment. And it wasn’t a skunk. There was a wallet on the street! It was near a streetlight or I would never have seen it. return this wallet to Warren. 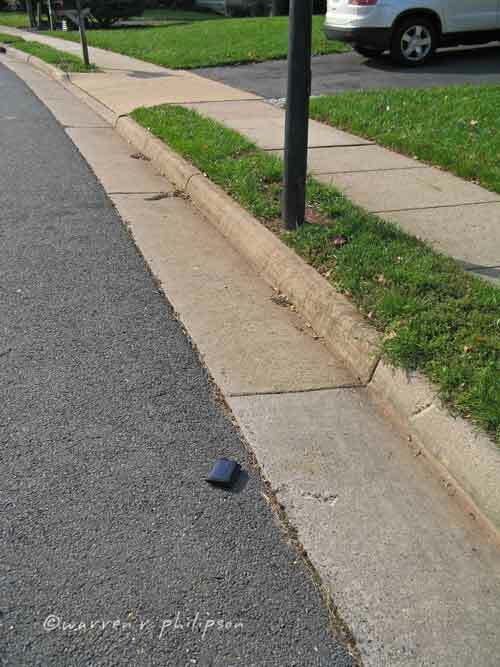 I nudged the wallet closer to the curb with my foot and kept jogging, nagged by the sense that I should do something to reunite the wallet with its owner. When I arrived home, I succumbed to the nagging and jogged back to the scene of my inadequate action. You would think that finding a wallet while jogging is a step up from encountering a skunk, but for the latter, there’s no question what to do. Run! What do you do with a lost wallet? At 3:30 AM. On the morning of trash and recycling collections. This is the second time I’ve found valuables while jogging. Several year ago there were four new $1 bills waving at me. Wallets you return to their owners; dollar bills you pocket and accept that the benefits of jogging exceed those that accrue to your health. During my afternoon walk, I’ve seen coins on the sidewalk or street. I treat these as belonging to the owner of the property I’m passing. I wouldn’t pick them up unless of course it was 3:30 AM. I guess most people don't bother to pick up pennies these days. How about nickels or dimes? There's probably a correlation with age. I bet most older folks like me would reach for any coin. Well, we would if we could bend. I hope little kids still get excited and pick up dropped pennies. When my daughter, Rachel, was about 8 years old, she went on a money-finding spree. I’m not talking just coins, though she found lots of those. She once found $40 in a public parking garage. What do you do, advertise? Will the owners please line up? Sorry; back to the wallet. It was dark leather and crammed with plastic. The address on the fellow’s driver’s license was only one house away. Ringing the doorbell at that hour didn’t seem wise, nor did sitting there to wait for a sign of life from the house. I could run home and write a note to hang, facing inward, on his storm door, except there was no storm door. Should I read and memorize his name, go home, find his phone number and call at a more reasonable hour? What time would that be? Would he have already given up his desperate search and departed for work? Before I retired, I used to leave shortly after 5 AM, and despite my daily make-a-wish, I was never the only one on the road. I considered putting the wallet in his mailbox. Likely he wouldn’t find it until he’d canceled every card and changed his name to avoid identify theft. I decided to leave the wallet on the floor of his front porch. Shrubs hid much of the porch, especially its floor, from the street and sidewalk. Plus, the porch light was turned on. Who would venture uninvited onto someone’s front porch? I mean who besides neighbors, siding and window salesmen, political campaigners, school booster club solicitors, girl and boy scouts and, ok, maybe a few others? I knew this wasn’t the greatest of solutions. Around here people generally depart for work via their garage not their front door. What should I have done? I invite your suggestions. The suspense was driving me nuts. Mid-morning, I walked by the wallet owner’s house. The wallet was gone! Finally I could relax knowing the wallet and owner were together again. Well, I’m pretty sure they were. I hope so. This blog post, with minor tweaks, appeared on the Stage of Life website on 28 October 2011. You’ll find a link to this outstanding website on my Watch List, but to expedite your search, I repeat it here: www.stageoflife.com.